With the New Age movement has come a considerable interest in Angels, which can be unhealthy. The angels of God always seek to avoid interest in themselves, seeking that all honour and worship should go to God. Satan, however, craves attention since he rebelled against God in order to attempt to become like God. Satan was created as a beautiful angel but since his fall has become "the father of lies", so an ill informed seeking after experiences of angels can be very dangerous. In order to be sufficiently informed we will look at what the Bible actually tells us about angels, as opposed to all the fiction that has been created around them. The Bible actually tells us a surprising amount, as expounded by Terry Law in his book, "The Truth About Angels". Here we will look at a few key facts. It is not stated directly, how many angels rebelled with Lucifer and are now engaged in his purposes of resisting the will of God and His angels and perverting the faith and walk of God's people. However, Revelation 12 v4 speaks of one third of the stars being swept down from heaven to earth by the tail of the great red dragon. With the exception of those who are involved in the occult, Satan appears to be happy that people remain unaware of him or believe that he is one of his fictional appearance. The pantomime devil in a red suit with horns, cloven hooves and a tail, carrying a trident working as proprietor of Hell. This Hell is the place to which bad people go to suffer various amusing torments, according to your taste in humour. Apart from the error of seeing only other people as bad and destined for Hell, this picture overlooks the fact that Satan is among the first to be hurled into the "lake of fire and sulphur"; he is not its proprietor. Mephistopheles, the suave tempter who gives Faust back his youth in exchange for his soul. This fiction overlooks that our souls are not for us to sell. Satan will see them condemned anyway as long as he can keep us from receiving salvation through Jesus. Satan has no need to give us anything. Having got that out of the way, let us remember that, when his eyes were opened, Elisha's servant saw that "Those that are with us are more than those that are against us" and look at what we are told about angels. The K'ruvim and Serafim have wings and brilliant a appearance like fire, which has been beyond the ability of those who saw them to describe. The messenger angels sometimes appear in the winged, white robed form, but at other times they appear as ordinary men (normal to the country and context in which they appear. They are only ever male - God created a fixed (large) number and they do not procreate and they do not die. They were created perfect (God could not do otherwise), having a free will, intelligence and emotions. They are entrusted with strength and authority. Reveal, guide, provide, protect, deliver, strengthen, encourage, assist, answer prayer and attend the righteous dead. Call God father, preach the Gospel, be redeemed, indwell man, act in their own power, become human, judge men, receive worship, reveal anything contradictory to God's word. Angels are not omnipresent. Many have testified to seeing angels when they have been in great need (not in response to curiosity) and have been rescued, protected, healed or encouraged. Create anything (they can only pervert God's creation), indwell a man in the way the Holy Spirit can, force you to take a course of action you are not willing to take, they are not omnipresent, are not able to read your mind (They are able to use thousands of years of experience of fallen human nature to predict your thoughts - unless you are living a Holy Spirit filled life, which Satan just cannot comprehend), they do not have power over people (they act mostly by influencing people to act on their evil desires). Satan (the name means Adversary) is given over forty names in Scripture, depicting different aspects of his nature. Satan is mentioned in seven books of the Tanakh and all the books of the New Testament. Satan is also referred to as, "the ruler of this world", "prince of the powers of the air" and "the god of this age" so he is obviously the one who controls worldly power and understanding. Thus the media war against God's chosen people is hardly surprising, and we should not rely on the world's news media in forming our world view. Terry Law's book lists thirteen characteristics of demons, but their main interest is in preventing people trusting in Christ, and causing those who have trusted to slide back into unbelief. They will encourage anything that harms the Church - self righteousness, legalism, political correctness, zeal for works etc. And still, Christians can fall for the deception of trying to communicate with angels. Called “The Angels Talk: The Message Board that Connects You to Your Angels,” the device is used to communicate with spirits. If it looks like a Ouija Board to you, that’s because that’s exactly what it is. 2019 , PulpitandPen reported that charismatics are using “Christian tarot cards.” Christalignment, a ‘ministry’ run by Jen Hodge, had put together a “destiny card” schtick to help “reach people” in the New Age movement. They have since pulled down their videos. We also reported Hodge’s association with Bethel Church, which at first repudiated the tarot card ministry but upon finding out that Bethel members were involved with it, then deleted their rebuke and affirmed the practice. 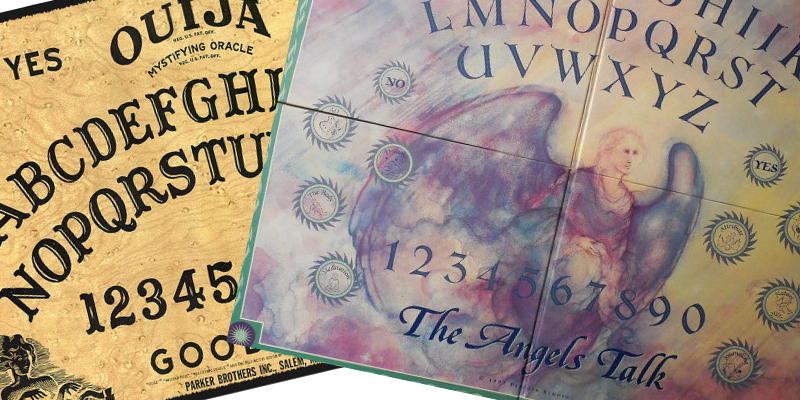 Steve Kozar at Pirate Christian Radio posted a satire piece about “The Bethel Board,” a Ouija Board-type device by which charismatics can summon the demonic. This story is appearing on multiple web sites but has not been investigated by Snopes.com. But Amazon are selling it, so the story appears to be more than a hoax. In Genesis 6:1-5 we read the following, in the run-up to the story of Noah and the flood. In time, when men began to multiply on earth, and daughters were born to them, the sons of God saw that the daughters of men were attractive; and they took wives for themselves, whomever they chose. said, "My Spirit will not live in human beings forever, for they too are flesh; therefore their life span is to be 120 years." The N'filim were on the earth in those days, and also afterwards, when the sons of God came in to the daughters of men, and they bore children to them; these were the ancient heroes, men of renown. saw that the people on earth were very wicked, that all the imaginings of their hearts were always of evil only. The mysterious Nefilim can be a source of fruitless controversy, but there are some clues about them in extra biblical sources. Nehemia Gordon and Dr Miriam Brand discussed this material in one of Nehemia's programmes www.nehemiaswall.com/hebrew-voices-nephilim-and-demons-in-enoch and this is a sketch of their studies. The book that comments on the Nefilim is the Book of the Watchers (Quoted in Jude) that is part of the Book of Enoch. Sons of God - Bnei Elohim - a term usually used of Angels in Hebrew scripture. Nefilim - born of the forbidden union between angels and human women. They were the mighty men. The root of the name, "Nefilim" is "fall" so they are fallen ones more than giants. So the context of this passage suggests they were a source of evil, and the book of watchers says they taught men and women skills for evil. Watchers, for whom the book is named, appear to be angels as the Hebrew / Aramaic, Irin / Irim means "awake ones" and angels never sleep. The reason these angels mated with human women was not just lust, but in order to have children. Angels (only male) are immortal and need not reproduce as humans do to replace themselves. God punished this transgression and limited human lifespan to 120 years, so that the Nefilim would not be immortal and continue passing forbidden knowledge to mankind. (Also, the Flood followed this incident ) So the Nefilim died out, but their immortal spirits did not die and they became disembodied spirits, seeking bodies to live in - they became demons. All of this is a matter of selecting the most likely interpretations, and may be material for fruitless arguments, so this passage is offered out of interest, but with cautions about its use. There are several occasions in the Bible where it is not clear if people have met with an angel or with God, for example Hoshea 12 v2-5. I had wondered if the Hebrew was ambiguous, but the words are perfectly clear; Malakh meaning angel and Elohim meaning God. The ambiguity is in the writing. Why? - It is almost as if there is little practical difference between the awe, seriousness, and importance of meeting with one of God's messengers and meeting with God himself. This may be controversial, but victory over the devil is not a matter of constantly casting out demons or extravagant prayers against Satan, but is a matter of keeping in tune with the Holy Spirit and continually dying to our old sinful nature so that our adversaries can not understand us and their lies will find nothing to stick to in our souls. We are not destroying Satan's armies - they were defeated at the cross, and their destruction is scheduled for a time yet to come. We do not fight Satan - Jesus defeated him - we just have to resist him. Before ascribing sickness to satanic attack, we should be certain our problems are of our own making through abusing our bodies. Let us not credit Satan with power he does not possess. Terry Law's book goes on to discuss authority in the spiritual realms and the fact that it is only we humans that appear to have a problem with authority. He explores the problems that arise from this, and how the Holy Spirit works with angels. He also draws out lessons for our walk. There are also appendices on other questions you may have about angels. That includes our media - and the world we live in !